Difference between revisions of "Bolshoi Circus"
[[File:Bolshoi_Circus_by_night.jpeg|right|thumb|330px|The Bolshoi Circus]]The "Great Moscow Circus on Vernadsky Avenue" ("Bolshoi Moscowskiy Tsirk na Vernadskogo" in Russian) was built under the reign of Leonid Brezhnev as First Secretary of the Communist Party of the USSR, and opened its doors on April 30, 1971. It is located on Vorobiovy Hills (formerly Lenin Hills), near Moscow University, at 24 Vernadsky Prospect (Avenue). Built by Yakov Belopolsky&#8212;one of the busiest official architects of the Brezhnev era&#8212;in cooperation with E. Bulikh, S. Feoksitov and V. Khavin (who may have been more familiar with the technical demands of such a structure), it is, with its 3,350-seat house and its numerous and specialized facilities, the world's largest circus building. [[File:Bolshoi_Circus_by_night.jpeg|right|thumb|400px|The Bolshoi Circus]]The "Great Moscow Circus on Vernadsky Avenue" ("Bolshoi Moscowskiy Tsirk na Vernadskogo" in Russian) was built under the reign of Leonid Brezhnev as First Secretary of the Communist Party of the USSR, and opened its doors on April 30, 1971. It is located on Vorobiovy Hills (formerly Lenin Hills), near Moscow University, at 24 Vernadsky Prospect (Avenue). Built by Yakov Belopolsky&#8212;one of the busiest official architects of the Brezhnev era&#8212;in cooperation with E. Bulikh, S. Feoksitov and V. Khavin (who may have been more familiar with the technical demands of such a structure), it is, with its 3,350-seat house and its numerous and specialized facilities, the world's largest circus building. Its unique technical fittings make it an exceptional tool for the presentation of all sorts of large-scale circus productions. The building includes a rehearsal ring, located backstage, behind the ring entrance, in a space vast and high enough to accommodate a large flying act; a stage above the ring entrance, which can connect to the ring with a giant telescopic staircase that unfolds automatically; the possibility for aerialists to access their apparatus from the ceiling; and several rooms at various temperatures to accommodate the upkeep of exotic animals. The building's heavy machinery was conceived with custom systems and elements especially designed for this project, and it became difficult to maintain or fix when needed, since there are no existing replacement parts. 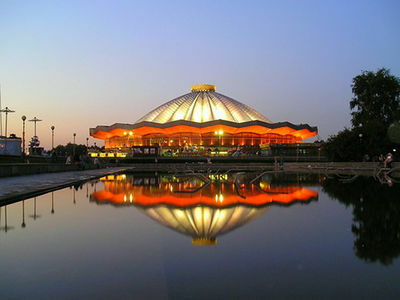 Furthermore, the building is located far from Moscow's center, and after the fall of the Soviet regime&mdash;and its system of corporate group sales&mdash;it had proved difficult to fill to capacity the 3,500 seats of a circus that is particularly expensive to maintain. 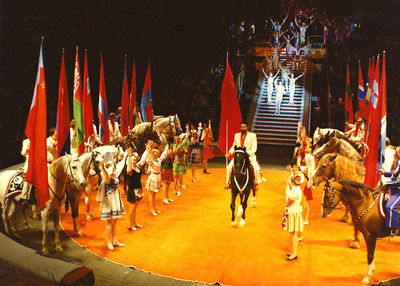 Although the Bolshoi Circus still offerered circus shows of the highest quality, its old downtown competition, "The Circus on Tsvetnoi Boulevard," today [[Circus Nkulin]], had reclaimed its crown as Moscow's&mdash;and Russia's&mdash;premier circus.